Cooler Heads Shell Plating Etc. Tail Shafts Frozen Pipes, etc. 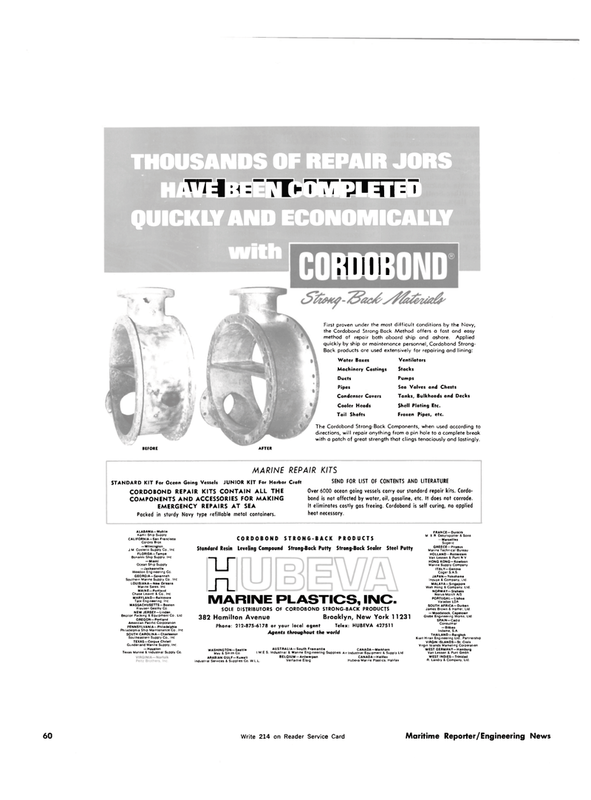 The Cordobond Strong-Back Components, when used according to directions, will repair anything from a pin hole to a complete break with a patch of great strength that clings tenaciously and lastingly. Packed in sturdy Navy type refillable metal containers. Over 6000 ocean going vessels carry our standard repair kits. Cordo- bond is not affected by water, oil, gasoline, etc. It does not corrode. It eliminates costly gas freeing. Cordobond is self curing, no applied heat necessary. J.M. Costello Supply Co.. Inc.
Southern Marine Supply Co.. Inc.
Chase Leavitt & Co.. Inc.
Beacon Packing & Equipment Co.. Ltd.
Philadelphia Ship Maintenance Co., Inc.
Texas Marine & Industrial Supply Co.
May & Smith Co. I.M.E.S. Industrial & Marine Engineering Supplies Air Industrial Equipment & Supply Ltd.
Van Lessen & Punt N.V.
Wah Hong & Company, Ltd.